Dr. Todd, It’s November (ie, Cold & Flu Season) and I feel like crud. What can I do to get over this? Yes. As it is #COLDandFLU Season, I get the above question quite a lot lately. One of the main things that we should be doing other than getting our spine adjusted, getting proper rest, eating clean and drinking our Kombucha is to be taking the appropriate supplements and herbs to support our immune system during this time of the year. So I recently had the honor and privilege of getting together with a whole food nutrition and herb guru from right here in central IL. I interviewed her about 2 supplements (1 an herb, 1 a whole food complex) which support or modulate the immune system. The truth is that you’d be asking for trouble by not taking these 2 supplements this time of year where we are definitely experiencing winter weather in Illinois. Cover Screen from Dr Annette Schippel on Echinacea Premium by Standard Process as interviewed by #DrTodd Austin for “The Dr. Todd Show” at AskDrTodd.com . 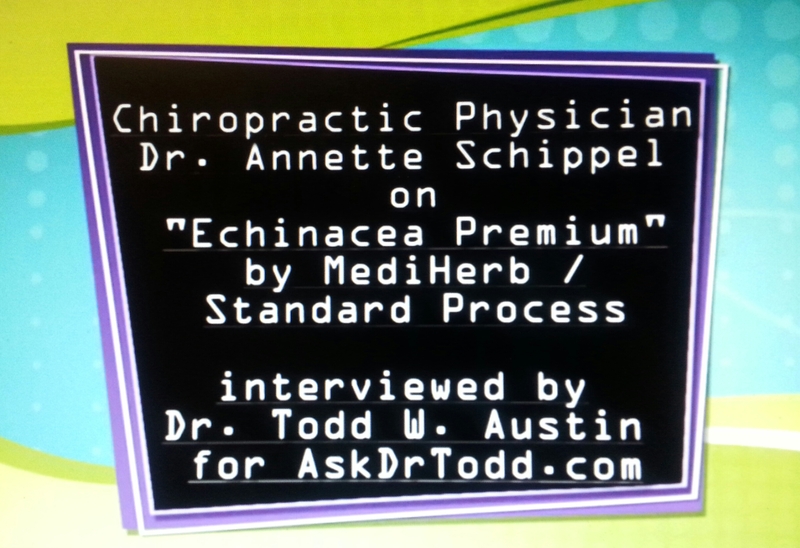 First, I interviewed Dr. Annette Schippel about ECHINACEA PREMIUM by STANDARD PROCESS / MEDIHERB. TY, Dr. Annette for helping me to get this awesome information on one of my favorite herbs to our viewers. #YouRock! Dr Annette Schippel Congaplex by Standard Process cover screen as interviewed by Dr Todd Austin for AskDrTodd.com . 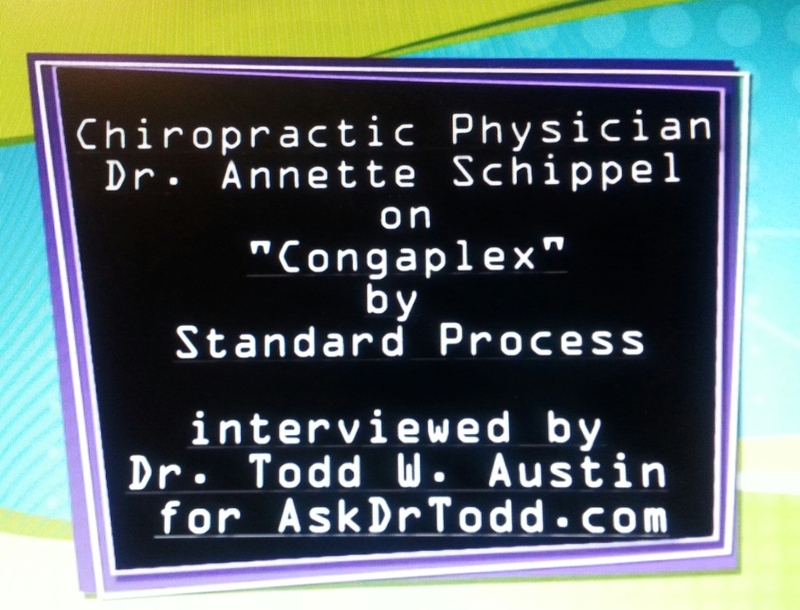 And lastly, Dr. Annette talked to me and our viewers about CONGAPLEX by STANDARD PROCESS. Both of these supplements are available at Austin Family Chiropractic in Virden, IL as well as at Schippel Chiropractic which has locations in both Jacksonville and Springfield.